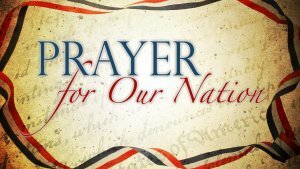 October 18, 2018 | By Robert Henderson, author of "The Courts of Heaven"
Pray this prayer every day until the midterm elections. Remember, we have a right to petition from His courts and see nations change! As you pray, be sensitive to the Holy Spirit, pausing where you need to, as well as adding your own words from the Holy Spirit’s unction. Lord, we humbly come before Your courts of Heaven and petition You on behalf of the United States of America. As we (Americans) approach the midterm elections in our nation we are in jeopardy of Your purposes being thwarted. We come before You and ask that You would have mercy on the nation of the United States of America. We ask that there would be a sweeping election of representatives who would stand for Your agenda within the US. We ask that from district to district, region to region and state to state those who carry Your heart, morality, ethics and desire shall be elected. We ask that President Donald J. Trump would have the men and women in Congress that are necessary to fulfill Your purpose in him and through him. We ask, Lord, that Your name would be glorified again within the United States of America and the values cherished by You would be upheld and re-established in our nation. We realize that we have granted the devil the legal right to possess these seats in the spirit world. He has set within these seats those who will do his will. Lord, we repent for any and all our sins of commission and omission that have allowed this. Lord we repent for not praying for those who are in authority as we ought to (1 Tm 2:1-2). We have been disobedient and have not taken our place in the spirit world seriously. Forgive us for this negligent activity. May we take our place in the realm of the spirit in prayer and no longer abdicate it. May we be empowered by You to pray effectively for these seats and those who are to be in them. Lord, we repent for not being active in the political process and abdicating our rights to vote responsibly. We ask for You to forgive us and even those before us. We ask for the Blood of Jesus to speak for us and the current occupants of these seats to be removed and filled with representatives who will return to Your purposes and Your will in the earth. Lord, we ask that those who represent Your heart would sit again in these seats of government! Lord, we have made money and greed our motivation and have allowed the devil to possess these seats. We have been a people of entitlement and have voted for those who promised us the most, regardless of their world-views and policies. We repent and ask for You to forgive us. May the Blood of Jesus speak on our behalf. We repent for being selfish and self-centered and allowing it to produce our world-view. Lord, we ask that you would deliver the culture of the United States of America from the socialist mentality that is driving it today. We ask that the heart of the culture would shift. Lord, let the powers of darkness that are fashioning the minds of this people be broken, even as we repent on behalf of ourselves and this culture. Lord, we ask that the covering over the people’s minds to be destroyed according to Isaiah 25:7, And He will destroy on this mountain the surface of the covering cast over all people, and the veil that is spread over all nations. Let every veil and covering, warping the minds of people in our nation, now be destroyed in Jesus’ name! Lord, we also repent for abortion and the blood of the innocent being spilled, which is empowering altars in the spirit realm that empower principalities over culture. We ask Lord that Your Blood would speak instead. Let the altars and their voices in the spirit realm be silenced by Your Blood and its voice (Heb 12:24). Lord, allow every mindset created by these voices against You within the US culture begin to fall. The powers of darkness that have created these mindsets in culture, let them lose their power and rights. As we repent Lord, have mercy on us and revoke the rights of these demonic entities that have shaped the thinking of culture. Let the minds within the nation of the United States be freed! We ask Lord, according to Daniel 7:25-26, that every intent of the anti-Christ spirit to change times and laws now be frustrated. Even as was promised, let the court of Heaven be seated and let this demonic powers’ rights be taken away and destroyed. Lord, we ask that the United States of America would be freed from this influence and its destiny be restored. We ask this Lord for the sake of Your purposes in America and the nations of the world. Let God arise and His enemies be scattered! Let There Be a Stirring! Now Lord, cause a stirring in the hearts of those who agree with Your heart. Let them arise and vote in these midterm elections on November 6, 2018. We ask that all passivity would be broken and removed. We ask that hearts are freed and moved to take a stand for You and Your purposes in America. Provoke the hearts of all, including the complacent, and let them arise and vote in Jesus’ name! The Lochnagar Crater sits now in the quiet, rolling countryside of Picardie in northern France. The people live in peace. Visit in July and you can see the crops ripening in the sunshine. The crater is huge – 98 feet deep; 330 feet across. It was created on a very different July morning – 1 July 1916 – the first day of the Battle of the Somme, when British forces detonated explosives under German army positions. The carnage of the Somme battlefield is unimaginable. Lochnagar’s sheer scale is a reminder of what happened. But the setting now is a sign of how God can restore peace to places of unimaginable horror.